Coala Magnetics are a cost-effective solution for businesses that need to refresh their displays on a regular basis. 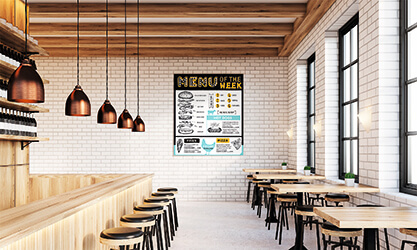 Printable, repositionable and quickly installed, the range is ideal for creating eye-catching promotional and communication applications in retail outlets, hotels, restaurants, museums, exhibitions and other public spaces. Coala Magnetics offers an innovative solution that combines magnetic adhesive base films, Coala Magnetic Base Films, with printable ferrous films, Coala Ferro Films. Slim and easily installed, Coala Ferro Films deliver high levels of print quality and are suitable for printing with eco solvent and solvent inks, as well as UV inkjet and latex inkjet. Without any professional assistance, users simply need to choose their preferred display surface (a wall, a door, a partition wall, cylindrical shape or even a vehicle) and place the Coala Magnetic Base Film on top. Available in a variety of formats and thicknesses, this material serves as the base for positioning the Coala Ferro Films. The range also includes the more traditional printable magnetic films Coala Magnetic PET or PVC, which are an excellent alternative solution for promotional displays or visual merchandising in retail environments. Available in several formats and thicknesses, they are water resistant and easy to remove. To create a permanent magnetic wall that can be updated with seasonal promotions in an easy and effective way.